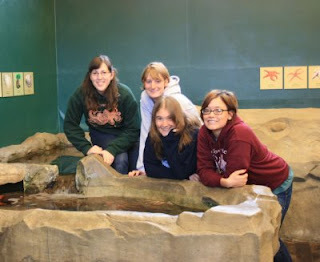 Welcome to the Port Townsend Marine Science Center blog! We plan to use this to reach out to visitors all year-round -- not just in the busy summer months -- and let you in on some of our behind-the-scenes activities like taking down tanks and special events. Sure, we have our website at PTMSC.org, but we wanted to write more about experiences of staff and volunteers at the PTMSC. Unlike our Marine and Natural History Exhibits, which close during the winter months, you can keep up with us in the comfort of your own home, preferably with a cup of hot cocoa, and see what we're up to all year long. There will be several people updating the blog, but most posts will be by AmeriCorps members Allison Gravis and Liza Jacobson. We started this blog as a Community Action Project through the AmeriCorps/Washington Service Corps programs and will be running it throughout our service year. 08-09 AmeriCorps Members (left to right): Liza Jacobson, Lucy Carpenter, Brenda Danner, Allison Gravis. Photo by Christina Pivarnik.